I normally think of sunflowers as a summer flower. I remember walking through my aunt and uncle’s garden when I was a kid. They had beautiful rows of sunflowers and was just amazed by their size and look. 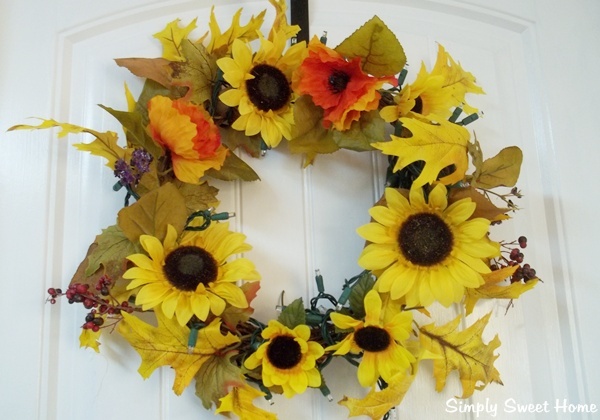 Today I’m taking this summer flower and mixing it with some other fall elements to create beautiful fall sunflower wreath. 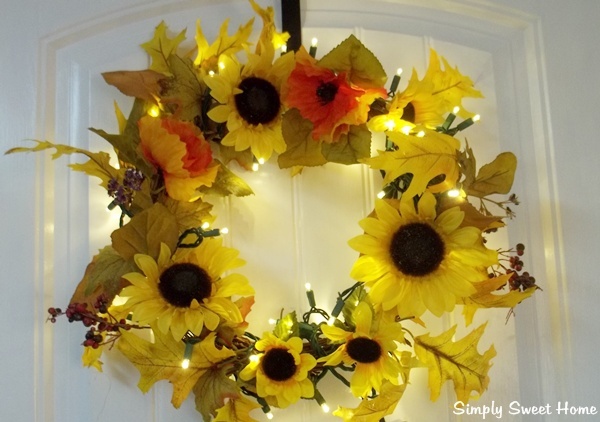 And to add even more warmth to these bright fall colors, this wreath is lighted with LED lights from Christmas Lights Etc. Use wire cutters to cut the faux flowers, leaving the stems just long enough for you to weave them through wreath. Next weave them through in any order you wish. Here in this example the leaves were put on first to give it a good “base layer,” followed by the sunflowers, which are the main focal point of the wreath, and then further embellished with extra flowers and berry sprigs. After weaving each piece through the wreath use hot glue as needed to hold the materials in place. Next wrap your light strand around the wreath. I suggest going around the entire wreath, and then after that wrap the lights around in various places, especially places where there may be a gaps. Just be sure that the light ends at the bottom of the wreath so that you can properly attach it to an extension cord. Plug-in and voila, a beautiful wreath for the day and the night! Disclosure: I received the lights used in this project for review purposes but was not otherwise compensated for this post. I like that. I found that sunflowers can fit for any season for decorating. Nice touch with the lights. 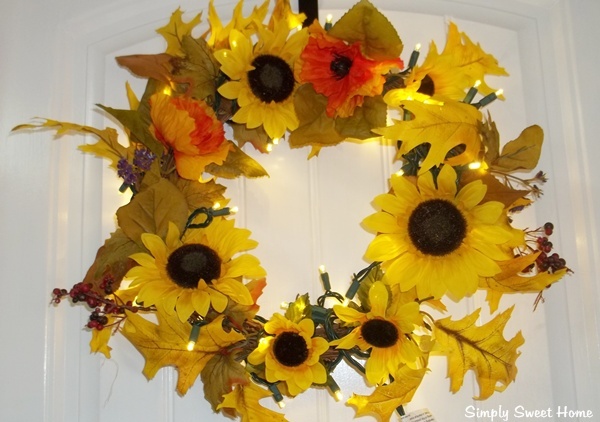 Love the use of lights in this wreath! I also use sunflowers for my fall decor! I think they are perfect! Thanks for sharing!